For Sunday brunch today we are chatting with debut author Gretchen Brandenburg McLellan about her picture book Mrs. McBee Leaves Room 3, and her experiences that led to her new career in writing. Q: What inspired you to write Mrs. McBee Leaves Room 3? A few years ago when my school district started making plans to open a new elementary school in the fall, every elementary teacher was interviewed to staff the new school. This created excitement and anxiety—a bittersweet mix of feelings that affected us all, staff and students alike. No one knew where s/he would end up. For many students, their sense of security is rooted in the geography of the school—knowing this teacher’s room is there and that teacher’s room is across the hall. I’ve had 5th grade students who were heading off to middle-school ask me through tears if I would still be in my room the next year. They needed to know that this part of their lives was stable as the tectonic plates of their lives shifted. 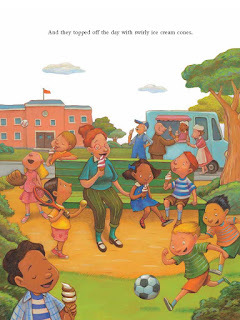 This connection to the geography of the school inspired me to write Mrs. McBee Leaves Room 3. Teachers leave for so many reasons: to have babies, to return to the university, to move to a new school or away from the area, to change careers, to care for themselves or family members who are ill, or finally to retire. All of these moves are bittersweet. At the same time as the upheaval in my own school district, a dear friend and former co-worker was dying of breast cancer. She had to say good-bye to her own elementary classroom and her students to her. I was able to dedicate Mrs. McBee Leaves Room 3 to her. It brought us both a bittersweet joy, knowing she wouldn’t live to see the art or the book in print. A memorial library has been established in her honor at Hathaway Elementary in Washougal, Washington where we taught together. I look forward to adding Mrs. McBee Leaves Room 3 to her shelves. I am sure she would love it! Q: Have you known any Williams and Jamaikas in your teaching life? What would you like readers to take away from their experience? There are usually Williams and Jamaikas in every classroom, the sensitive observer who has his own way of processing feelings and change, and the bossy organizer who has a master plan for everything and wants everyone to toe her line. There are students who take a long time to test the water and others who plunge right in. What I’d like them both to learn from each other is respect and compassion and to honor each other’s contribution to the whole. In an increasingly complex and multi-cultural world, we need to understand the limits of our own points of view and be open to expanding them. Q: In your experience as a teacher, how do you help students make challenging transitions? Children’s literature is always a guide! Reading aloud a picture book that depicts children encountering the same challenges is my first go-to. 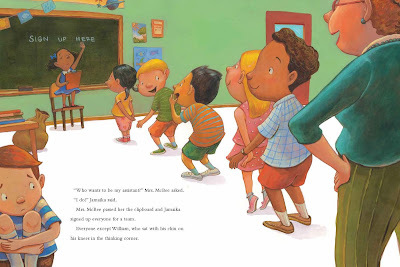 I hope that Mrs. McBee Leaves Room 3 will be a go-to book for teachers, too, when it is time to say good-bye. It will help children understand and name their feelings, and learn that to be human is often to have conflicting emotions. Mrs. McBee Leaves Room 3 will be especially helpful if a teacher is leaving his/her class for any reason. It’s important that teachers tell their students that they will be leaving, because most elementary school children visit their former teacher/s as soon as school doors open in the fall. Some visit the day after school gets out for the summer! If children come to call and their teacher is not there, the geography of their lives trembles. Teachers look forward to this fall visiting ritual, too. In her new classroom Mrs. McBee would find the fall experience bittersweet, wishing she could see her kiddos again, to see how much they grew and to hear about all their summertime adventures both inside and outside of books. Q: Do you have any favorite memories from teaching? There are too many to name. Every day with children has moments that are special. For a reading specialist, seeing students engrossed in a book by themselves or enjoying sharing a book with a reading buddy, and hearing laughter or the words “I love this book! I love reading!” is always great. When children say they don’t like reading, they haven’t yet found the transformational book that settles into their hearts and feels as if it were written just for them—the book they will hug tight and read again and again. Connecting kids with this experience is fantastic! Another kind of pivotal experience in becoming life-long readers is hearing that special book read aloud. I love feeling the magic of a perfectly selected read-aloud book transform a group of children. A delicious alert silence wraps around the group and children listen, transfixed. After one such reading, a little girl looked up at me in awe and whispered, “You are magic!” The moment was magic and only possible through the amazing books I had in my classroom library. My shelves were like an instrument panel in my cockpit. I loved hopping up and pulling a book from my shelf, knowing that YES, NOW! was the moment for this book. Through books we took off and soared! Revision is a different process entirely, much more intentional and rational, although it involves a lot of letting go and being ready to recognize ideas when they come, un-beckoned. Q: How has your experience as a reading specialist influenced your writing? When I’m writing picture books, I relish in language, employing poetic devices and paying attention to the sounds of words flowing one after another. I never underestimate my readers/listeners, knowing that for most, the experience of a picture book is an interactive one, shared with an adult who is an accomplished reader and who can make the text come alive and answer any questions that arise. Mostly, I write from the heart about experiences that matter to children. These are the kinds of books that will create readers. Q: Your book is about the bittersweet celebration and acknowledgement of transitions. What is bittersweet to you? As a reading specialist, I am privileged to help students struggling with reading. My success always means that I no longer will be their teacher. It is always sad to say goodbye—but such a celebration too! My decision to leave teaching and focus on my writing has been a bittersweet decision as well. I am lucky that my books will take me back to schools as a visiting author, keeping me close to children and their world. You’ll find me reading aloud and signing my books in bookstores, visiting schools and libraries, teaching writers and presenting at library conferences. And I will forever be a student of writing and literature myself, attending writing conferences and workshops, learning from others in the field and reading, writing and reading some more. I am also looking forward to the release of three more of my picture books. When Your Daddy’s a Soldier, illustrated by E. B. Lewis is on Beach Lanes Fall 2017 list. I’m Done! will be released by Holiday House Spring 2018 and Button and Bundles by Knopf Fall 2018 (TBA). Mrs. McBee Leaves Room 3 will be at your local library, indie bookstore, or Barnes & Noble on April 1st!